Baby Mama Drama: What about Toasty?? 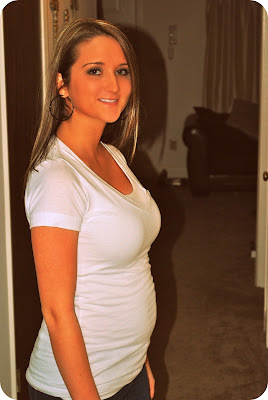 I started scrolling through the blog last night and realized that I've only been updating everyone on me and the little meatball in my tum tum. But what about Toasty, you ask? Oh, you didn't? Well, I'm going to tell you anyways! Adam and been so incredibly busy with school this semester. He's in the last leg of getting his degree so the classes are much harder. It doesn't help that he has really sucky hard professors who don't like to teach the materials. He goes to study hall and tutoring every. single. night. (6:30-9:30) and then has to come home and study some more! Plus, the baseball team has officially started practice which takes up the remaining of his time (when he's not in school or studying). Good news though, the Toaster is going to be Alabama baseballs first base coach this season! HOLLER! We kind of had an idea that he would be, but is wasn't really confirmed until a few days ago. He's super excited about that! On top of all of his school he will also be traveling with the baseball team once the season starts. So obviously I pretty much never see my husband. We do, however, play each other on Words With Friends all day long, but that's about the extent of it. I kid, I kid. I see him approximately 4 times in the middle of the night during my pee breaks, although he is usually sleeping. It's the thought that counts! Ok, enough about Adam. Back to ME!!!! We had our doctors appt yesterday afternoon. I was really excited when we didn't have to wait for two hours, especially since something was wrong with the air conditioner. Nothing like a waiting room full of hot, sweaty, hormonal, huge pregnant women. I was a stupid-forgetful-tard and accidentally went to the bathroom before leaving the house which then resulted me in chugging 4 gallons of lemonade before going to the doctor, which then resulted in me feeling the the Hoover Dam overflowing when it came time to pee in the cup. Which, by the way, WHY is the cup the want you to pee in the size of a shot glass? If they're going to give me a cup that small to pee in the either A) need to give me a funnel to pee in so it goes in the cup, or B) give me a latex glove. Ladies, am I right, or am I right??? Because at this point I swear I could have filled up a Bubba Keg of urine for them, but I didn't, because they don't need that much. Anywho, enough about my pee. Let's get to the more important details. I've officially gained 5 pounds. And I am about forty eleventy percent sure that eating Five Guys and The Cheesecake Factory on Saturday had absolutely nothing to do with that. The nurse came in and we listened to the nuggets heart beat. Our first appointment we went to, at 7 weeks, the HR was 135. At 12 weeks it was 173, and yesterday at 16 weeks it was 158. Everyone has been betting it's a girl , but I'm still thinking it's a boy! I've had several dreams about it being a boy, too! We are still talking about names but will probably just wait until we find out what it is to really argue talk about it. We go back on Valentine's Day to find out boy or girl! This might be the longest two weeks ever! Well, GAC just started showing an hour long special on Tim McGraw music videos, and I feel like that's my cue to go now. Ahhhh, he's beautiful. Adam, I mean. We're talking about Adam now. He's beautiful. 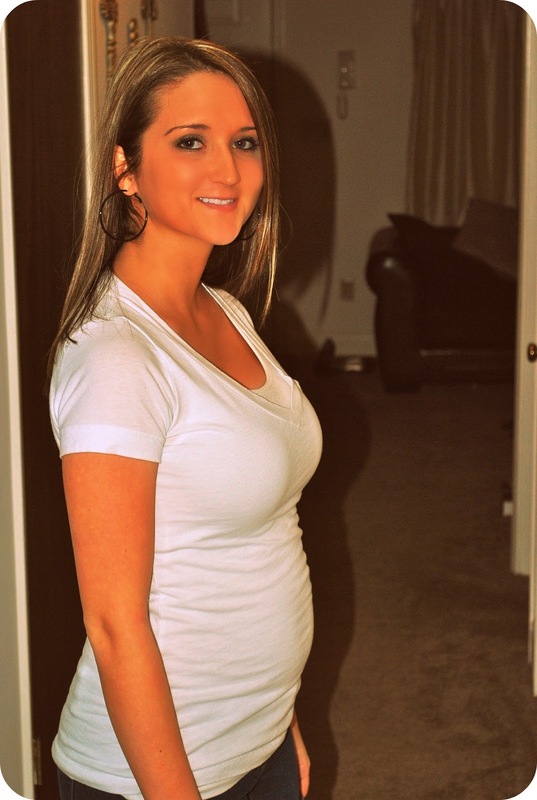 You are a cute preggo and one hot momma! I miss you girl! I really like your new header and design! You look fabulous! And I completely hear you on the cups at the OB office!! I hate that part.